Do you find yourself handing out fewer business cards than you did ten years ago? You’re probably not alone. With lawyers turning more to LinkedIn, Twitter and other digital alternatives to connect with others (both business contacts and clients), there’s a very real case to say that in the US and UK, in the not-so-distant future, business cards may be a thing of the past. Asking to connect on LinkedIn. One of the great uses of LinkedIn is that it provides an online address book, much more easily searchable and sortable than a stack of business cards or a paper form address book. And getting in touch with a person thereafter is possible at the click or touch of a button, with the ability to send a message from anywhere at any time. Note, however, that in some situations a lawyer may not want to connect with people on LinkedIn, for instance if on opposite sides of a litigation or for family lawyers connecting with their clients or looking up spouses of divorcing clients on LinkedIn, where there is a professional practice risk. Also, as with Twitter noted below, not everyone is on LinkedIn (yet!). Connecting via email and rely on a searchable email inbox for finding the person in future. .vcf files downloaded from a lawyer’s profile on their website can also help. Using other digital apps. Some of the companies behind these such as CardCloud have, themselves, predicted the end of physical business cards (MIT Technology Review post). Note that some of the main ones that gained a great deal of investment such as Bump (which allowed users to share contact details by ‘bumping’ smartphones; note this was acquired by Google before being shut down) have disappeared mainly because of the significant popularity and simplicity of the options already outlined above. Contrastingly note that some apps help sustain the business card in a digital context, such as CardMunch (a LinkedIn app – note this was discontinued) and CamCard (which allows for scanning of business cards), which has gained significant traction with over 100 million users. Third, lawyers are starting to exploit the potential in virtual meetings, with less reliance on meeting face-to-face. This trend has also been picked up by Richard Susskind, author of “Tomorrow’s Lawyers”, who predicts that lawyers will be forced, due to economic pressure, to take advantage of the technological opportunities of working remotely and spending less on expensive fixed assets such as elaborate offices. Online dispute resolution is, for instance, one of the fast growing trends that will encourage more remote working. And what about at face-to-face meetings? Former lawyer Jay Shepherd shared his experience of attending a legal conference a few years ago on the Above the Law blog: “When 1,500 lawyers gathered at this week’s ABA TechShow in Chicago, an interesting thing happened: The business card died…instead of exchanging business cards, many of the attendees were trading Twitter handles — their online identities that begin with the @ symbol. (I’m @jayshep.) Massachusetts lawyer Gabriel Cheong (@gabrielcheong) told me that by the end of the conference, he had collected exactly zero business cards”. Sceptics will say that such an event was geared more towards tech-savvy lawyers and that it was at a conference rather than a more private business meeting so, as such, these comments aren’t so relevant to the rest of the profession. But these lawyers are merely ‘early adopters’, embracing technological trends earlier than others who will inevitably follow in later years. Third, they’re relatively cheap. Even with today’s emphasis on strong branding consistency across all stationery, the cost of the initial branding consultancy to get the lawyer’s firm’s identity portrayed effectively in business card form and then for the printing of the cards (even for tens or hundreds of lawyers) shouldn’t break the bank. With most branding agencies, the business card is just one small piece of all firm stationery. And for sole-practitioners and small law firms, the cost of a few thousand business cards using a local or online supplier will always be minimal; indeed the price is getting driven down and even TV ads continue to offer significant discounts on basic business card design and printing. Ultimately, it appears that the business card isn’t going to get cut from today’s average law firm’s budget any time soon: it’s cheap, convenient and to some extent still expected. But there are significant trends towards other digital alternatives. 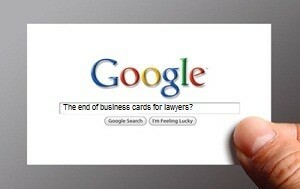 While today’s generation of lawyers may be compelled to keep using business cards, even in their non-creative boring traditional form, the next generation of digital-savvy lawyers, many of whom will be working remotely for much of their work, may be much more willing to rely purely on other, much more practical options. What do you think? Especially interested in hearing from you if you are a lawyer with a strong opinion on this, one way or the other. Also if anyone wants to send in a photo of your own business card, I’d be delighted to publish for the audience, particularly the more creative examples. Next post: Will 2016 be the year lawyers unleash their inner legal publishers?